This one might just be too much for some people but I get the sense of humor with this hilarious urinal beer mug! I think we all know a beer lover who would get a kick out of this novelty gift. This mug holds a generous 28 oz of your favorite beverage. Talk about a unique and cool design! BigMouth knows what they are doing with their intelligent, humorous designs! The novelty set of two wine glasses has a super clever design: one wine glass says, “wanna get tipsy?” and the other says “let’s get tipsy!”. If you are Christmas shopping for a wine lover this might just be the perfect set to add to their growing collection of wine glasses. Know a coffee obsessed person in your life? I don’t know about you but I make sure I am always well-caffeinated to get through the day and you will never see me drinking a cup of decaf coffee! This novelty mug by Big Mouth would be the most perfect gift for the coffee lover. Last but not least I had to throw in a BigMouth fave of mine and this is a coffee mug that I actually do have this poop mug in my collection of mugs. This was a gift from a friend and it surely brought a smile to my face and a great big ol’ laugh! Coffee makes me poop! 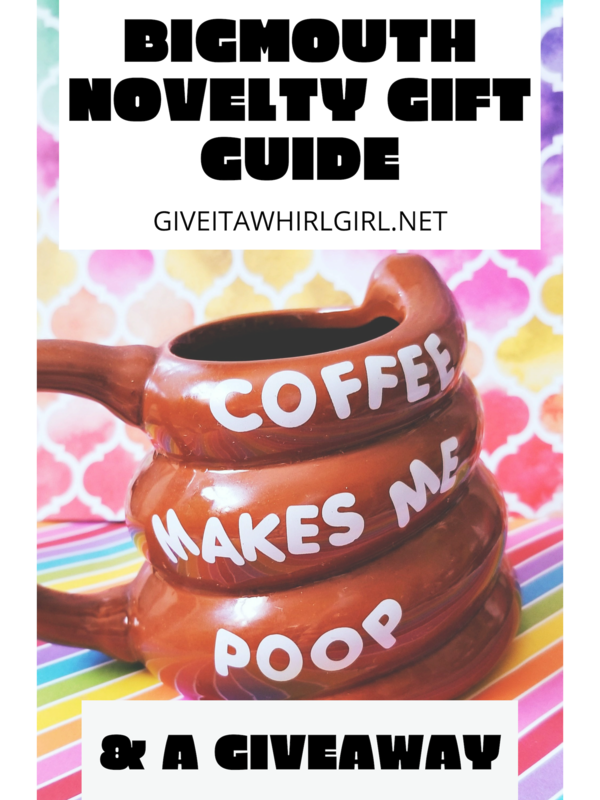 This mug would be the perfect gift for the coffee lover in your life that still makes poop jokes. Hope you enjoyed this novelty gift guide with items from BigMouth! What novelty gifts will you be ordering for gift giving? Leave me a comment and let me know! Would you like to win a $15 AMAZON gift card to kickstart your Chrismas shopping? Click the link below to throw your name in the hat and good luck to all! I am giving away an Amazon gift card on my Facebook page! Want to see more from Big Mouth? This entry was posted in Giveaway, Shopping Guide and tagged amazon, avocado, beach blanket, beer, BigMouth, cheeseburger, coffee mug, cotton candy, decaf, fart, funny, gift, gift guide, hotdog, humor, ice cream cookie sandwich, lollipop, morning, mug, novelty, pineapple, pizza, pool float, poop, popcorn, popsicle, poptart, rainbow, shopping, shopping guide, strawberry, sushi, taco, toast, towel, tropical drink, unicorn, watermelon, wine, wine glass. Bookmark the permalink. You have had and still do have such nice little giveaways!!!! I am interested to learn more from your blog!!! Thanks for the chance to win and the awesome recipes! This novelty coffee mugs are so neat looking, I would love to have one for my kitchen coffee drinking.